The Polynesian waters are the joy of the deep sea fishermen who thus respectively make a living for themselves and their families. 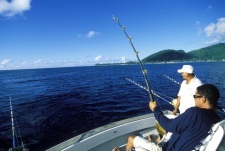 Deep sea fishing is not a restful activity but rather an active one. It requires control of the instruments used and a good knowledge of the sea. Tahiti and Her Islands make it possible for you to live such an adventure and to appreciate fresh fish in a very different way. 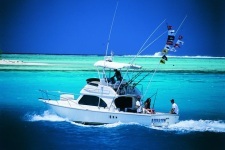 The deep sea fishermen have the pleasure of welcoming you aboard their boats and enable you to discover the sea life. Once caught and depending on its state, the fish is generally thrown back into the water. Nevertheless, if it is wounded it will be divided between the crew and you of course. Tahiti Nui Travel has selected the best for you !